Sure Start children's centres in England are being starved of funds and the network is shrinking as councils implement funding cuts, the shadow education secretary has said. The grant that funds the network had been cut by about 22%, Andy Burnham told MPs in an opposition day debate. He said councils around the UK were closing centres or cutting services. Education Secretary Michael Gove said many councils were maintaining services and enough money was available. Some of the 3,600 Sure Start children's centres are being cut because the grant that funds them was cut by 11% in last year's emergency budget, and again in the comprehensive spending review by almost the same percentage. Then the government removed the protection from the Sure Start budget. This has left them vulnerable, as councils seek to make up losses to their central government grants overall. Mr Burnham was proposing a motion urging the government to reconsider removing the ring-fencing. He listed examples of cuts from around the country, such as Derby, where he said six centres were threatened with closure, Barnet where he said eight of 21 centres were losing their funding, Bromley, which he said was closing 13 of its 16 centres, and Hull, where he said a 50% cut to children's centre funding meant 13 out of 20 would be "effectively mothballed". Mr Burnham also spoke about "smoke and mirrors" in cases such as Hammersmith and Fulham, where centres were not being closed but services in some were being cut in a model of "hub" and "spoke" centres. Some of these "spoke" centres had just a £25,000 annual budget, he said. "Children's centres are closing - right here, right now, highly skilled staff are being made redundant, some centres are keeping the lights on, but nothing more than that," said Mr Burnham. "Sure Start is being starved, it's shrinking. Coalition policy is turning a much-loved, universal service into a patchy, postcode lottery, breaking the prime minister's promises to parents," he said. However, several MPs spoke out to say centres were not being cut in their areas, including West Sussex, Tameside, Ipswich and also Medway, where funding was being increased. The shadow education secretary also told MPs Hampshire council intended to close 28 of its 81 children's centres. But the council had announced on Wednesday that all centres would remain open and cuts of £6m to its £17m budget would apply to back-office expenditure only, leading Mr Gove to accuse Mr Burnham of a "slur" against Hampshire. He said Labour was peddling "gloomy predications" that later turned out not to be true. Ministers have said that enough money remains in the system to keep Sure Start centres open, even as the coalition works to reduce the national deficit, but that they also want to see services better targeted to meet the needs of the poorest parents. "Independent witnesses say the money is there. Well-run local authorities all over the country represented by councillors of different parties are maintaining that network," said Mr Gove. "In just a few days' time when people think about how to cast their vote I hope that people will reflect on which parties are acting responsibly in dealing with the national crisis and which parties prefer posturing, irresponsibility and the emptiness of eternal opposition," he said. Labour MP Frank Field, who was commissioned by the coalition to carry out a review of social mobility and early years education, said he believed the government was unlikely to reverse last year's decision to remove the funding ring-fence. 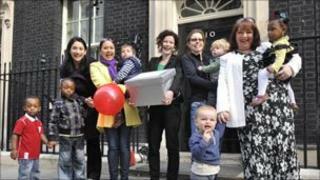 But he said he hoped that the coalition would, in future, preserve dedicated funding for early years provision. However, he also questioned whether there was enough information available to assess whether Sure Start funding was being "spent in the best way possible". Shadow education minister Sharon Hodgson said it was "simply not true" there was sufficient funding to maintain services. "There isn't enough money, not if ministers expect councils to deliver all the other important programmes that grant pays for, such as breaks for disabled children," she said. Children's Minister Tim Loughton said the government was "100% committed" to Sure Start. The aim was "universal services, accessible to all, with targeted support for the families in greatest need" he said. But this should be achieved by trusting local authorities to make decisions, giving centres more flexibility and involving a greater diversity of providers, he said. The motion was defeated by 312 votes to 217.